Air India Declared As 3rd Worst Performing Airlines In The World By FlightStats; Air India Says Ranking Is Fabricated! In a major embarrassment for flag carrier airline of India: Air India, a ranking has declared them as world’s 3rd worst performing airlines in the whole world. This is their 8th such ranking, and Air India is clearly not amused by it, as they have termed this ranking as ‘fabricated’. 1 Air India Is World’s 3rd Worst Airlines? Air India Is World’s 3rd Worst Airlines? With 38.71% score, Air India is ranked #3 in the World Airlines of the World list. Besides tracking the monthly data released by US Department of Transportation on punctuality of airlines, FlightStats uses 500 other sources to finalize the ranking; some of which are: airport runway times, radar services logs, official airline records, airport data, flight-tracking and positional services, and tons of data procured from Eurocontrol and the Federal Aviation Administration and other regional aviation hubs. The tag of worst airlines in the world has been assigned to El Al, which is flag carrier of Israel, as it received 56% score in bad performance. 2nd worst airline in the world is Iceland Air with 41.05% score, followed by Air India at 38.71% score. KLM Royal Dutch Airlines, which is the flag carrier of Netherlands has been declared as the best airline in the world after studying various factors. Iberia, the flag carrier of Spain is the 2nd best airlines while Japan Airlines, flag carrier of Japan is at #3. Meanwhile Air India has come out strongly against this ranking, terming it as fabricated and unreal. Meanwhile, both Indigo and Spice Airways have been included in the list of the best Asia-Pacific Airlines, besides JAL, Virgin Australia, Singapore Airlines, ANA, Qantas, Air New Zealand, Cathay Pacific & Jetstar. 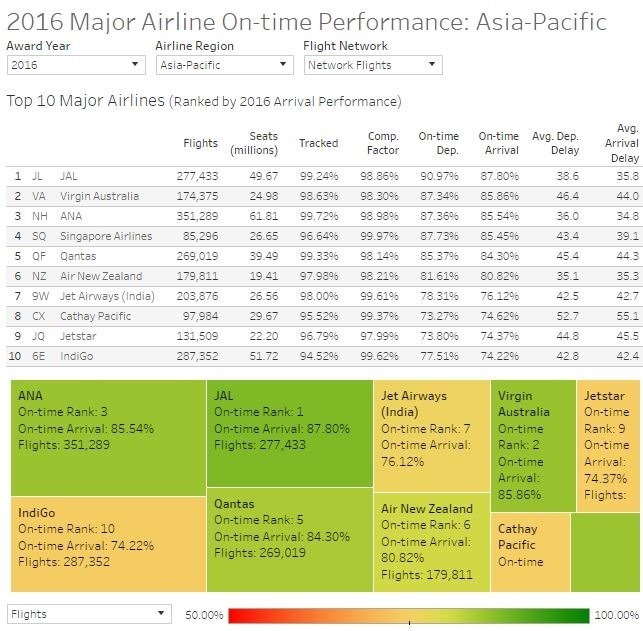 You can access the complete ranking of all global airline carriers here. "Air India Declared As 3rd Worst Performing Airlines In The World By FlightStats; Air India Says Ranking Is Fabricated! ", 5 out of 5 based on 1 ratings. Telecom Stats Oct 2016: Reliance Jio Added 19.6 Mln New Subscribers; Total Reaches 1078.62 Mln!